Hafford is a town in Redberry No. 435, Saskatchewan, Canada consisting of 407 residents at the 2006 Canada Census. It is located near Redberry Lake, which consists of only salt water. The first overseer was T.G. Bavin for the village of Hafford in 1914. The Hafford Village Council and Board of Trade requested a doctor, and Dr. Whitemarsh was appointed for the village. The early community was first served by Luxembourg Post Office. The early village had three lumber yards, a general store, I.H.C. agency, a poolroom, livery barn, hardware, and post office. In 1913 the Canadian Bank of Commerce and the first restaurant opened. The hotel and bar were established in 1914. Power came to Hafford in 1916, and the Hafford Rural Telephone Company was established in 1916. The Hafford hospital was built in 1922. Hafford was served by the Ukrainian Catholic Church established 1911, the Ukrainian Orthodox church built 1909, the Roman Catholic Church erected about the same time. The Anglican church was built in 1918, and the Methodist church which was erected in Hafford moved to Richard. The Hafford community was served firstly by the Whiteberry School District which constructed their school building over two years 1906-1908, opening in 1909 followed by the Rus School District opening 1910. In this area, the Alberton School District, Gooseberry School District, Slawa School District and the Craigmore School District were all organised in 1912. The Hafford School District and Nauka School Districts were organised in 1914, Langley School District 1916, and both the Lost Lake School District, and the Canada School District in 1918. Historically, the railroad connecting Prince Albert and North Battleford was laid in 1913, and upon the rail line, a site was chosen for the village of Hafford site. The community is served by Hafford Airport which is located 1 nautical mile (1.9 km) northwest and the Carlton Trail Railway that runs parallel to Highway 40. Vivian Prokop, named for three consecutive years in the WXN Top 100 Most Powerful Women in Canada 2010, 2011, 2012 & recipient of a 2013 Queen Elizabeth ll Diamond Jubilee Medal from Prime Minister Stephen Harper for her contribution to entrepreneurship in Canada which launched 5,000 new businesses creating over 20,000 new jobs as the CEO of The Canadian Youth Business Foundation (CYBF), and for her international work as the Founder of the G20 Young Entrepreneur Alliance (G20YEA). The Dominion Government Illustration Station was operated between 1932-1955. This station tested grains, and fertilizers and improved livestock. ^ "2006 Community Profiles". 2006 Canadian Census. Statistics Canada. 30 March 2011. Retrieved 24 February 2009. 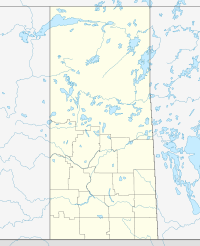 Wikimedia Commons has media related to Hafford, Saskatchewan.